Warren Gatland has named his Welsh squad for the 2019 Six Nations tournament, who will be led by captain Alun Wyn Jones. The experienced squad sees the same ten front-row forwards who featured in Wales' 2018 Under Armour Series squad are again named. Scarlets pair Rob Evans and Wyn Jones along with Nicky Smith are named as the loose-head props with Elliot Dee, Ryan Elias and Ken Owens the hookers in the squad. Leon Brown, Tomas Francis, Samson Lee and Dillon Lewis provide the tight-head options. Captain Jones, who has amassed 120 Wales caps and 48 Six Nations appearances to date, is joined by Jake Ball, Adam Beard, Seb Davies and Cory Hill as the second-rows. Ross Moriarty, Aaron Wainwright and Justin Tipuric who all featured for Wales in the autumn are again named. Josh Navidi returns from injury to be included in the squad alongside call-ups for the versatile Josh Turnbull and Thomas Young. Wales have selected the same three scrum-halves that featured last November in Gareth Davies, Aled Davies and Tomos Williams. Gareth Anscombe, Dan Biggar, Rhys Patchell and Jarrod Evans, who made his international debut in 2018, are named as the fly-halves. 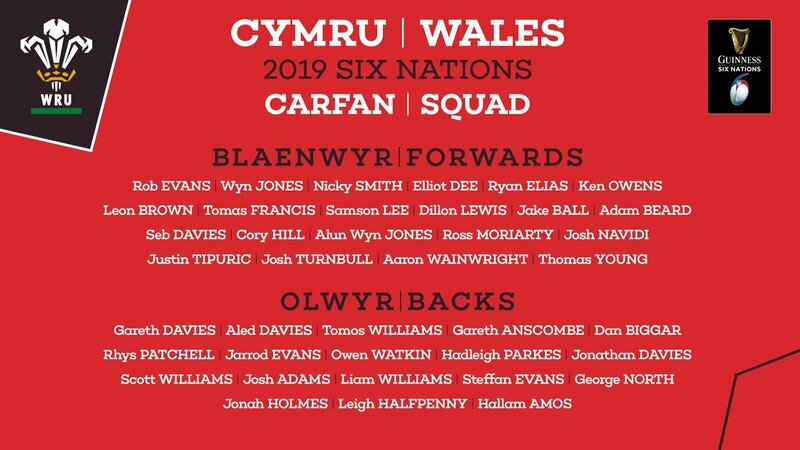 Jonathan Davies, Hadleigh Parkes, Owen Watkin and Scott Williams are the four centres named. Josh Adams, Hallam Amos, Steffan Evans, Leigh Halfpenny, Jonah Holmes, George North and Liam Williams provide Wales' back-three options.